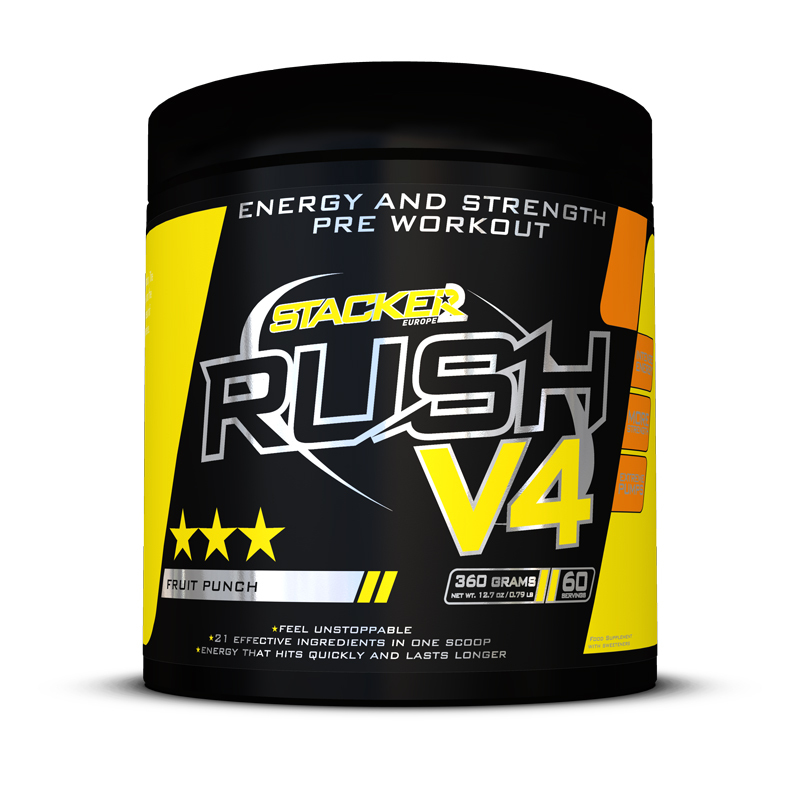 RUSH V4 is formulated to be the most extreme and effective pre-workout product on the market today. The development process is never-ending. A lot of research is being conducted on performance-increasing extracts and the best combinations of ingredients that increase energy, strength and focus to the max. RUSH V4 is the result of this continuous search. RUSH V4 is built on solid science, years of study and decades of professional experience. It’s a complete reformulation of our successful RUSH Enraged formula. 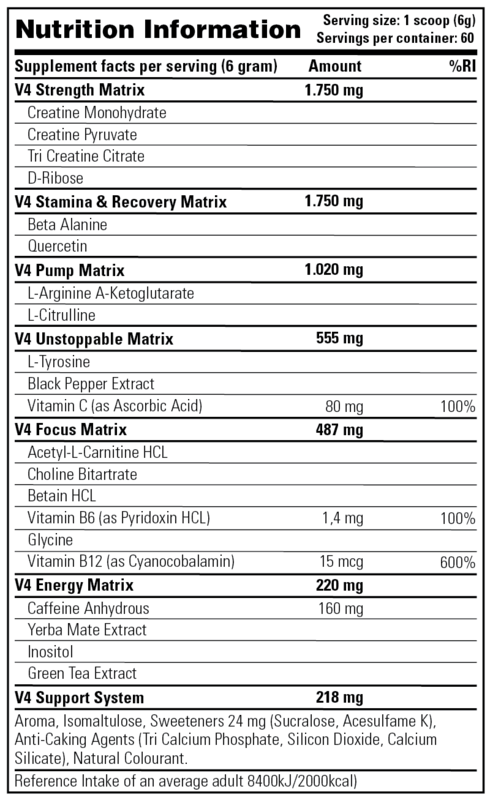 Next-generation formula with 21 key ingredients! RUSH V4 not only brings you the most powerful key ingredients, but also gives you the perfect combination in the right doses. RUSH V4 contains a total of 21 ingredients, including a never-before-seen combination of citrulline, quercetin and betaine. The innovative RUSH V4 composition ensures that you can get the best out of yourself at every physical level. No other pre-workout supplement is so complete and has been so accurately combined as RUSH V4. What role do the ingredients play in optimizing your performance? Through the stacking of these four substances, you experience a powerful surge of energy. The energy boost stimulates you to train harder, and the energy enables you to sustain your efforts for longer. These four forms of creatine have been clinically proven, and give you a short-term super-strength. Daily use of creatine gives an increase in strength up to 10%, which has been scientifically proven. Arginine and citrulline are amino acids with a high nitrogen factor. This N.O. effect is responsible for your muscle pump and your fantastic physique right after an intense workout. Many pre-workouts are only able to stimulate muscle strength and energy. RUSH V4 goes further, through the incorporation of six focus ingredients into its formula. This unique stack will enhance and create razor-sharp focus. This way you’re able to train at a new higher level. Delayed acidification gives you a great advantage. It’s a marginal gain that gives a huge difference between winning and losing when the intensity of your training is close to your physical limit. Train longer and harder! What to expect? More endorphins, a great fit feeling and less stress hormones. This is to ensure that your body recovers more quickly after an intense workout, and it prevents muscle breakdown. You can go harder, train more frequently and achieve your goal faster. If you’re looking for a state of the art sport supplement that makes all the difference in terms of strength, stamina and maximum performance, look no further. Get RUSH V4! RUSH V4 is available in 30 servings and 60 servings. Besides the most popular flavour, fruit punch, there are 5 more fantastic fruit flavours available. High caffeine content. This is a food supplement. Food supplements should not be used as a substitute for a varied diet. This product is to be used in conjunction with a sensible diet and exercise program for best results. Please store in a cool, dry place and keep out of reach of children. This product is not intended for anyone under the age of 18. This product is not intended to diagnose, treat, cure or prevent any disease. Do not use if you are pregnant or lactating. Consult an expert if you also use other supplements and stimulants like caffeine, or a monoamine oxidase inhibitor (maoi). Don’t use this product if you have heart or vascular disease, high blood pressure, diabetes, glaucoma, thyroid, kidney or prostate problems. Never exceed 2 scoops per day. Take one serving (1 scoop) RUSH V4 mixed with 200 ml of water, 20 minutes before training. Once tolerance has been assessed and you are looking for an additional boost, then you can take 2 scoops before your training. Don’t take more than 2 scoops per day. What is the most popular Rush V4 flavour? The best sold flavour is Fruit Punch! Besides the most popular flavour, there are 5 more fantastic fruit flavours available. How many scoops can I take per day? Don’t take more than 2 scoops per day. Have used it for several years, and I notice an increase in my concentration and muscle power. I find it especially effective at the end of a training session. Very good product. Energy and Endurance 9.5/10 – as the title of the review says – prepare for an energy rush! I am not joking, guys. I am currently finishing the tub (5-6 servings left) and I can honestly say that, in terms of energy, this stuff rocks.